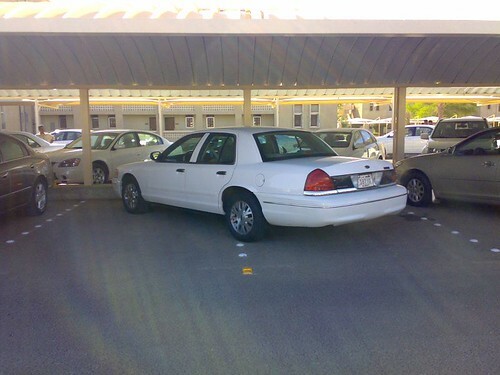 Mr. Bo9agr: Wrong Parking, Again !! is this a trend or is this guy just playing stupid? same car, same guy, same parking mistake. this pisses me off !! maybe he's reserving a space for someone he knows. 1. put a paper on his car containing every swear word I can think of. 2. (more likely) asakir 3alaih. leave a paper 3ala his car n tell him park nafs elawadem u fool! gonna wait till the 3rd time thn i must take action !! عاد هذا الحيوان صج ..
sooo 9arat el mara elthaltha.. yallah take action! sorry, didn't see him.. i'll look for him next time i go to uni. عاد هني لعبتك .. اذا شفته ثاني مره واقف جذي .. اخذ مسمار وانـحت على باب سيارته بالكبير "يا اثول اصفط عدل على مصفط واحد"